March 11, 2015 - Two Sikorsky UH-60 Black Hawk helicopters assigned to the Hammond, La Army National Guard were participating in a training exercise overnight. One of the helicopters with four aircrew and seven Marines assigned to Camp LaJeune, N.C, was involved in an a fatal crash over waters off Florida during a routine night training mission. Debris has been found near Eglin range site A-17, east of the Navarre Bridge, which is located on a small strip of land between Choctawhatchee Bay and the Gulf of Mexico. The helicopter was reported missing at about 8:30 p.m. March 10. Debris from the aircraft was located by search and rescue team at about 2 a.m. this morning. Search and rescue efforts are underway at the accident site currently. The second helicopter and its personnel on board have returned and are accounted for at this time. 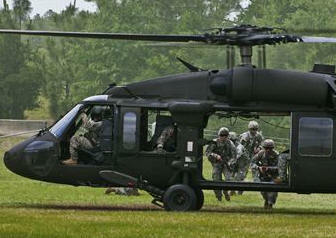 The helicopters are assigned to the 1-244th Assault Helicopter Battalion in Hammond, Louisiana. They were participating in a routine training mission involving the Marine Special Operations Regiment from Camp LeJeune. Names of the aircrew and Marines on board are being withheld pending notification. The accident is under investigation. At this time it appears that there are no survivors. Weather condition at the time was poor visibility and a low cloud ceiling. It was reported that the helicopters were flying close to the water.